Link to the FTP site for Texturing and Modeling: A Procedural Approach. Link to the BMRT Home Page. This book contains a toolbox of procedures upon which programmers can build a library of procedural textures and objects. Procedural rendering, modeling, shading and texturing are of growing importance in computer graphics and animation, and, this is the first comprehensive book covering these topics. It also includes extensive explanations of how these functions work, and how to design new functions. Serves as a source book for those writing rendering systems, shaders and animations. Discusses the design and implementation of noise functions. Contains procedural modeling of gases, hypertextures, mountains, and landscapes. Procedures are presented in C code segments or in Renderman shading language. The included CDROM contains the code from within the book for easy implementation. This book gives the reader a working knowledge of several procedural texturing, modeling, and animation techniques, including two-dimensional texturing, solid texturing, hypertextures, volume density functions, and fractal algorithms. We provide the reader with the details of these techniques, which are often omitted from technical papers, including useful and practical guidelines for selecting parameter values. This book provides a toolbox of specific procedures and basic primitive functions (noise, turbulence, etc.) to produce realistic images. An in-depth description of noise functions is presented, accompanied by several implementations, and a spectral comparison of the different noise functions. Some of the procedures presented can be used to create realistic images of marble, brick, fire, steam, smoke, stone, clouds, characters, and planets. The introduction of procedural or "solid" textures in the mid '80s revolutionized computer graphics. Procedural textures can model things as diverse as fire, terrain, clouds, water, trees, bricks, star fields, and even entire planets with potentially unlimited detail. The striking aspect of the procedural approach is that these complex visual phenomena all issue from terse algorithmic descriptions. For years, creating procedural models has seemed a black art. 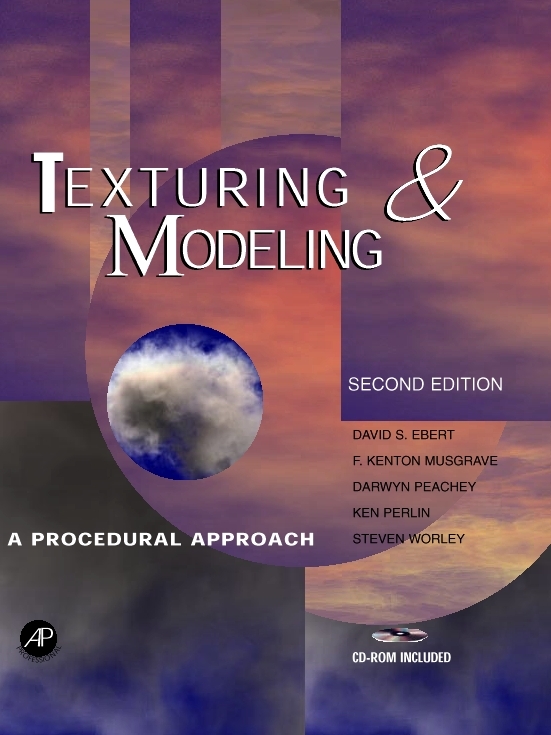 The new book "Textures and Modeling: A Procedural Approach" by Academic Press brings together five experts in the field of procedural models -- David Ebert, Ken Musgrave, Darwyn Peachey, Ken Perlin, and Steve Worley -- to demystify this arcane field. The text provides detailed explanations of underlying methodologies, such as the so-called "noise" function and fractals, and provides many ready-to-use examples in both C and the RenderMan shading language. It is the first book to treat this important topic in detail, and we hope it will provide a valuable reference for this popular area of computer graphics.